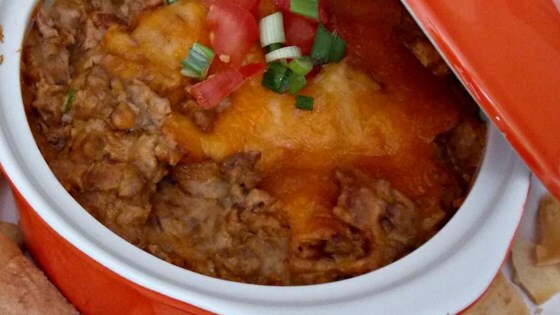 "A quick and easy recipe that has become our favorite for football game day. It is so tasty and is filling too. Low fat cheese works well in this also. Serve with tortilla or corn chips and side of guacamole." Stir ground beef, refried beans, 3 cups Colby-Monterey Jack cheese, sour cream, cream cheese, and taco seasoning mix together in a bowl until well mixed. Spread mixture into the prepared baking dish. Bake in the preheated oven for 20 minutes; sprinkle with remaining 1 cup Colby-Monterey Jack cheese. Continue baking until cheese is melted, about 5 more minutes. This all got eaten - that is a good thing! BTW - this can be made and placed in a slow cooker to keep warm. Just added more cheese and covered the top with jalapeno slices. Took it to work and it was gone in no time. I will definitely make it again very soon. An excellent and easy recipe. My only future modification will be to spice it up next time with some Rotelle.